As we enter in to the Memorial Day celebration, please take the time to reflect on the sacrifices of our fallen heroes. GOD BLESS AMERICA!! Jerry is expecting to perform some limited shows in 2017. New merchandise will be forthcoming as well. Stay tuned for updates.....! After a years break, Jerry is bringing North Country back to the stage for a big show! You'll remember these folks - "Murph" Martell, Mark Kos, Brenda Weber, Calvin Walls, Rich "Doc" Horton, and featuring Jason Sopic on bass guitar. It's great to have some of the original members back to jam! C'mon out and join us!! My lovely wife and I want to wish y'all a very Merry Christmas and pray that you'll be able to reflect in the peace of the season (Luke 2:8-11). We've posted some show dates for 2015. Stay tuned for upcoming info on more dates on the 2015 show/video schedule. God bless y'all for all the support! See ya next year! It's hard to believe! The 2014 Elk Expo (http://www.elkexpo.com/schedule-of-events.html) is only 2 weeks away (Aug. 16-17) at the Elk Country Visitor Center (www.experienceelkcountry.com)! Jerry will be hitting the stage from 11:30 ~ 1:00 right before the elk license drawing by the Pennsylvania Game Commission (http://www.pgc.state.pa.us) at the event. Make plans now to enjoy a day of food, fun, and music in the mountains of North Central Pa.! With the summer tour all but wrapped up, it's great to spend some time in my "No Cell Phone Zone" in the Pennsylvania mountains! This short video is the reason I love gettin' out there! It's been a fun year, and a BIG thanks to all who came out to see us! We have one more show Saturday Oct. 12 at the fall festival in downtown Clearfield. We'll be hittin' the stage about 2:oo, so c'mon out, party with us, and enjoy a beautiful Autumn day and good ol' country music! Jerry and North Country will be performing live at the legendary Wheeling Jamboree on Saturday, June 15. 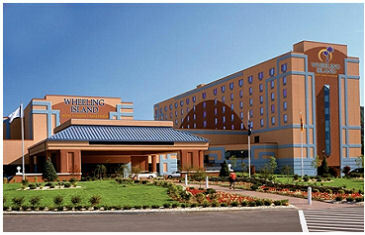 The Jamboree is celebrating it's 80th anniversary and now calls the Wheeling Island Casino and Resort its home. Included is a round trip ride, ticket to the show, limited edition T-shirt, and a day of fun and music at the casino. Now here's the cool part ~ when you get to the casino you'll get $30 worth of play credits for the slot machines (you MUST be 21 to be on the gaming floor). That means you'll actually only be paying $35 for the entire trip! Bus is filling up fast, so reserve your spot today! Get ready! We're gonna be making an announcement in the near future about a great event this summer. If you're a golfer, or just enjoy some great country music, you'll wanna check back! Better yet, sign up in the email box to be one of the first to know! We've got a lot more show dates coming as well, so stay tuned.......! We hope everyone had a great holiday season, and that the new year brings you prosperity and joy! As we begin scheduling our Summer Tour 2013 we want to start the new year by saying "THANK YOU" to all of you who came out to Jerry and the bands shows in 2012, and especially a BIG THANKS for supporting our efforts to raise some money for the Penna. Wounded Warriors! We're planning on raising the bar this year to do even more for the Pa. WW, and will be updating you on projects in the near future. Please sign up for Jerry's email updates and be on the cutting edge of the most current promotions and shows in 2013. Lots of exciting news to come soon! See ya on the road soon! Stay tuned..........! Yep, it's that time of year already! Thanksgiving is already behind us and Christmas is only 2 weeks away ~ WOW! I really love this time of year, and I'm excited to announce that for the first time in about three years, I've once again scheduled a Christmas Concert at the CAST Theatre in Clearfield. Brenda Weber will also be joining me for this festive show, and we're really looking forward to bringing lots of your favorite classic Christmas songs to the stage to celebrate the "reason for the season"! The show will be on Friday, December 21 at 7:30pm and will be a great time to wrap up (no pun, really!) the shopping season and just relax and enjoy an evening of music! Ticket price is $5.75 each, and you can contact Ruth at the CAST office at (814) 765-4474 for reservations and information. As in the past, we'll be doing some give-a-ways and other fun stuff. As a lot of you know, I've been raising money throughout the summer show season for the Wounded Warriors Project, and we'll be continuing that promotion and be donating a big part of the show and raffle proceeds to the project. I hope y'all are doing well, and we REALLY look forward to seeing you on the 21st, and celebrating the season with you! God bless you, and be safe out there!! WOW! How the time flies........! Here we are 3 weeks into the autumn season, and Jerry and the bands final show of the year is upon us! C'mon out and party with us on Saturday Oct. 13 in downtown Clearfield at the 2nd annual Fall Festival. Showtime is 2:00 pm on the Lezzer Lumber stage that will be set up outside of Hedge's restaurant. The weather looks to be a beautiful fall day, and we're predicting a large crowd, so get there early and enjoy the variety of vendors and crafts before heading to the show. It's gonna be a great day to enjoy the fall season, so make plans to be there! Hey folks! Yep, it's about to happen! We're in the process of updating the look and feel of Jerry's website and newsletter. We'll let you know when it's up and running, so in the meantime make sure you sign up for the updates at the top right of the page. We've also got some show dates soon to be posted for 2102. Look forward to seeing you on the road......! We hope y'all had a safe and enjoyable 4th of July weekend ~ God Bless America! Speaking of America and our military, We're excited to let you know that we were able to raise over $800 for Tomorrow's Hope at our show with Smokin' Joe at the Wagon Wheel! It's a good start, and I know we can do it bigger next year, as plans are already in the making for the second annual event! We've been getting a HUGE amount of inquiries from people coming home for the Clearfield Fair asking if we'll be jamming at the winery. Well no, we won't be there this year BUT......Jerry and North Country will be hitting the stage for the first time at Dingers in Clearfield ( http://www.facebook.com/pages/Dingers/115042209615) on Saturday, June 30th. They've got a great new stage there, as well as a big screen TV on the deck, so you can hang out by the river, enjoy a great show (there may even be a special guest join us), and meet up with some old friends who make the annual trek home for the fair. We'll hit the stage at 9:00, and there will be a $5 cover at the door. This is THE place to be to help you kick-off your fair week! Don't forget next Friday (7/15) we'll be at Heritage Days in Philipsburg, and the following Friday (7/22) at Houtzdale Days. Click http://jerrycountry.com/calendar.html for more details. Though it just got started, summer's gonna zip by fast, so c'mon out and party with me and the band sometime soon! We'll be looking for you! C'mon out and enjoy Jerry and the band at Knoebel's (http://knoebels.com/) this Thursday June 23 for three great shows! Showtimes are 1:30, 6:00, and 8:30. Knoebel's is one of the coolest family owned amusement parks in the country, and a great place to bring the family. See ya there! Hey y'all! The 2011 tour season is ramping up and Jerry and the band are ready to hit the road and see ya on the trail! Here's a BIG one you don't want to miss! Jerry is teaming up with his friend Smokin' Joe Meholic to put on an awesome evening of country music to help raise money for the Tomorrow's Hope program. Tomorrow's Hope is a Veterans of Foreign Wars (VFW) program that aids homeless and troubled vets in their time of need. You can but your tickets online today at http://jerrycountry.com/products.html, at your local VFW Post, and at Clearfield Pharmacy. You can also use your credit card by phone by calling (814)765-8231 Other locations to be announced soon. Bring your lawn chair and join us for this great event! You can even bring along your own beer (cans only please) to sip on while you're enjoying the show! Food will also be available at the show. GET YOUR TICKETS TODAY AND COME JOIN US!!! Hit the "Show Dates" tab for a full line-up of shows, and keep checking back as we're adding shows all the time. Better yet, sign-up for the newsletter in the upper right corner of the page and get all the updates as they're announced! Now you can click and watch Jerry's 1 minute video honoring our fallen military heroes from his song Unknown Soldier. Tomorrow (Saturday) they'll be returning to perform at the Wheeling Jamboree! This time the show will be outdoors at the historic Brush Run Park in St. Clairsville, Ohio, the original home of the Jamboree in the Hills. Also joining Jerry onstage will be Deep Water and D. David Stiles. The show starts at 6:30 pm and once again you can watch it LIVE at www.wheelingjamboree.tv. If you're enjoying time with friends and family and have a computer handy, tune in to the show and allow Jerry and North Country to be part of your party! Ticket price for the show is $10, and you can get directions to Brush Run Park at http://www.wheelingjamboree.org/shows.php. They may even do some onsite backstage reporting before the show at http://www.ustream.tv/channel/jerry-country. On Monday Sept. 6, you can join them at the annual Cooper Picnic in Drifting, Pa. This is a great event! Lots of people, awesome food, and great afternoon of entertainment! They'll be performing from 4 to 7 pm, and there's no charge to attend. If you can't make the trip to the Jamboree, join us in Drifting to celebrate Labor Day! Updates will be coming soon on next week's shows, but for now, have a safe and enjoyable holiday, and we hope to see ya at one of the events this weekend!!! The first show will be at Starr Hill Winery (http://www.starrhillwinery.com/) in Curwensville, from 2 to 5 pm. Those of you who have joined us there before know what an absolutely AWESOME time we have at this event. Those of y'all who are gonna join us for the first time are in for a real treat! Bring your lawn chairs for an afternoon of music, wine tasting, and fun under the tent! Make sure you take the tour of the winery, and plan on a relaxing and enjoyable time on "The Hill"! The second show will be at MoJo's (http://clubmojosclearfield.com/) from 8 pm to midnight. I believe this will be the first time they've had a country music show at MoJo's. This should also be a blast, as they have a great stage for the performers and an atmosphere to socialize and have fun! If ya just can't get enough of us at Starr Hill (ha, ha), take a nap afterwards and join us at Mojo's for a double shot! For those of y'all coming to town for fair week, this would be a great day for you to join us at one of these shows (or both) and party with us! FINAL NOTE: Y'all have been AWESOME in support of my one minute video supporting the troops! I could still use some more hits to it, and if you haven't rated it yet, please put your cursor on the star (5!- LOL) and rate it. Still got about a week to go before the finalists are announced, but the more views I get, and the better the rating may sway the judges in my favor. To view and rate it go to http://www.hannity.com/videos. Right above the horizontal row of videos, on the upper left, you can click the tab for "Most Watched". Just go to the second page of the most watched and you'll see it there titled "The Unknown Soldier". If ya got a minute to watch, even if you've already done so, please do and also PLEASE PASS THIS ON!!! Here's an exciting announcement! We've put together an incredible package for folks who want to see Jerry and the band perform live at the historic Wheeling Jamboree on May 1st! The package includes roundtrip bus ride, ticket to the show, a limited edition Jerry Logo T-shirt (like the picture above) for the Wheeling Jamboree, a logo travel mug, and a digital download card for Jerry's new CD "It All Comes Back To Me". The price for the package is $50/person, and the bus will leave from Clearfield, Pa. Scheduled times will be announced later. More info about the event is available at the Jamboree homepage at http://www.wheelingjamboree.org/index.php. If you would like to pay by check or money order, email us at beverly@jerrycountry.com and we'll get that information out to you. We look forward to having lots of y'all join us for this awesome show trip!!! Check out the store link! We've got the new T-shirts, ball cap, and koozies available now! Hey folks ~ You can now follow Jerry on Twitter! Go to www.twitter.com/jerryschickling to connect for lots of cool "Tweets" from Jerry as he and the band hit the road, and get exclusive "back-stage" stuff only the Twitter follower's will have access to. Follow Jerry and enjoy!! Jerry and the band will be traveling to Wheeling, WV to perform at the historic Wheeling Jamboree on May 1st! The Wheeling Jamboree is the 2nd longest running "live" radio broadcast shows in the country, next only to the Grand Ole Opry! This is pure County Music legacy, and Jerry couldn't be more honored for the chance to be on the show! Look for updated information on bus tour information/pricing for those who would like to travel to Wheeling and attend the show. Jerry will once again return to the CAST Theatre for a festive Country Music Christmas performance. Fresh off of the release of his new CD â€œIt All comes Back To Meâ€, Jerry is excited about this yearâ€™s show: â€œIâ€™m really looking forward to the Christmas show this yearâ€ he said. â€œAfter having to cancel last yearâ€™s show, I canâ€™t wait to see all the folks who come to CAST to celebrate the season with me!â€. Once again this year Jerryâ€™s show will feature the incredible voice of Brenda Weber, as well as Mark Kos on acoustic guitar, and a new addition to the show Kathie Ann Pearcy. â€œKathie Ann has been playing keyboard and piano with me for the past few years, and I her asked her to join us for the show. I think the folks will enjoy the songs sheâ€™ll be singingâ€. In addition to the traditional Christmas favorites like Winter Wonderland, Joy To the World, Away In A Manger, Oâ€™ Little Town of Bethlehem, and others, Jerry will be singing a song titled Unknown Soldier that is featured on his new CD. â€œUnknown Soldier is a heart-felt tribute to our military and fallen heroesâ€ Jerry stated. â€œItâ€™s my small way of saying â€˜Thank youâ€™ to all the men and women who have bravely served and sacrificed for our countryâ€. There will be prizes given away throughout the show to anyone who brings some non-perishable food items to donate to the Clearfield/Curwensville Ministerium food bank, and raffle tickets will be sold for the chance to win a guitar that will be autographed by Jerry and the gang. The proceeds from the guitar raffle will be donated to the Freedom Alliance Scholarship Fund. The Freedom Alliance was founded by Col. Oliver North, and honors the bravery and dedication exhibited by Americans in our Armed Forces who have sacrificed life or limb defending our country by providing educational scholarships to their children. Join Jerry and Brenda Weber December 19th at the CAST Theatre for a night of festive Christmas music! We missed last year due to family heatlh issues, so this year will be an awesome return to the CAST stage! The live webcast of Saturday's CD Release Party went over well! In spite of the low-tech equipment, we've had lots of good feedback from people from all over the country who watched. Thanks to all who joined us on the web, and look forward to more live webcasts in the future!